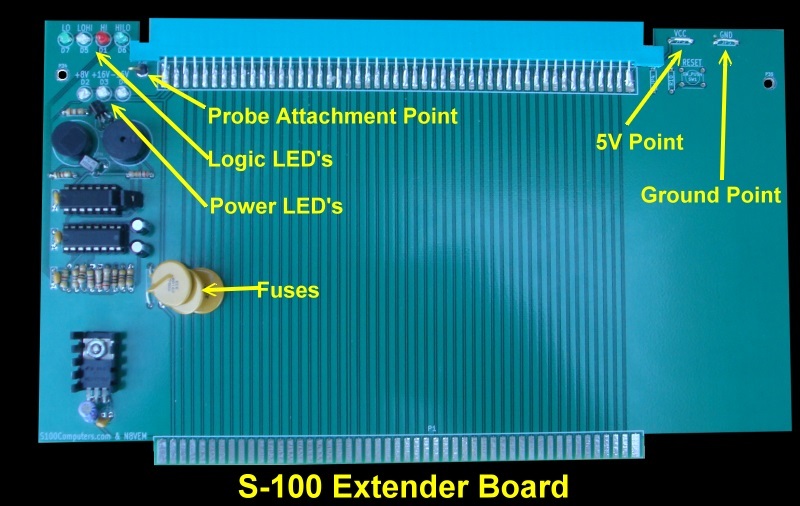 If you do any kind of serious work with your S-100 system you will need an "Extender Board". 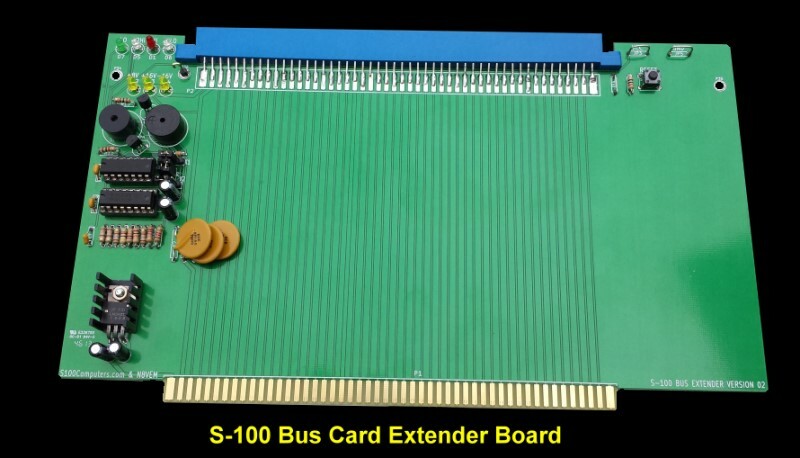 This is a card that fits into your S-100 bus and brings the bus edge connector up to the top of the buss that you can easily access the boards components. Before we go further however it is important to remember that these extender cards weigh down the bus signals and at high speeds can cause the system to fail. However for testing purposes in the 4-6 MHz range they are invaluable. There are a number of S-100 extender cards out the (and on eBay from time to time). They range from just an edge connector up to boards with a basic logic probe. However be careful with some of these old connectors. They may be cracked along the side (due to people not pulling the test S-100 card straight up when removing it), or worse still, some edge connectors not connected to the bus signals. My goal was to make a reliable S-100 card with some useful indicators/functions on the card. Here is a picture of V2 version of the board. 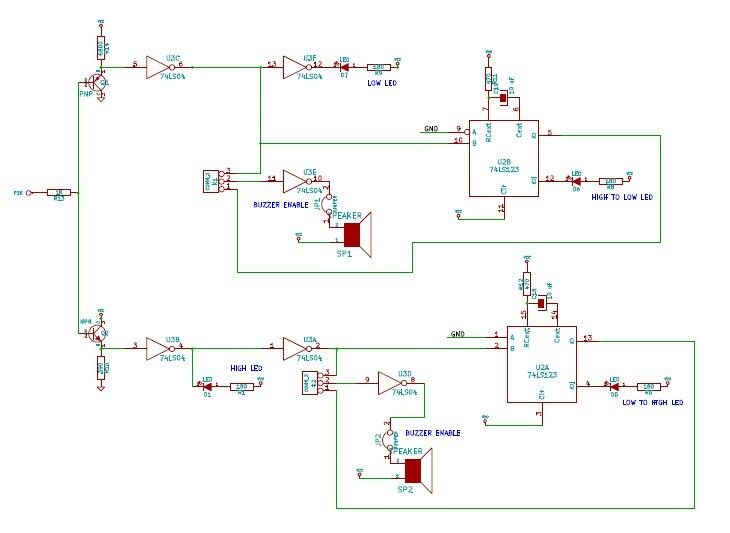 The board has four LED's along the top left hand side of the board and a probe attachment point to test for a Logic High, Low, a logic High to Low transition or a logic Low to High transition as well as their corresponding continuous pulses. There is also a high and low sounding buzzer for the High and Low states. This can be inactivated with two jumpers. There are three LED to indicate +8, +16 and 16 Volts on the bus. These lines also have 1.6A fuses (Jameco #199938). On the right hand side there is a system Reset button as well as a ground and +5 volts attachment point. Here is another picture of the board. The logic is very straightforward. The 74LS04 turns on the Hi/Low LED's depending on their input and sounds the buzzers. The 74LS123 detects the High to Low or Low to High transitions and flashes the appropriate LED's. The only tricky spot is the actual input from the probe. Because you don't want the LED's and Buzzer stuck High or Low when the probe is not connected to anything (i.e. 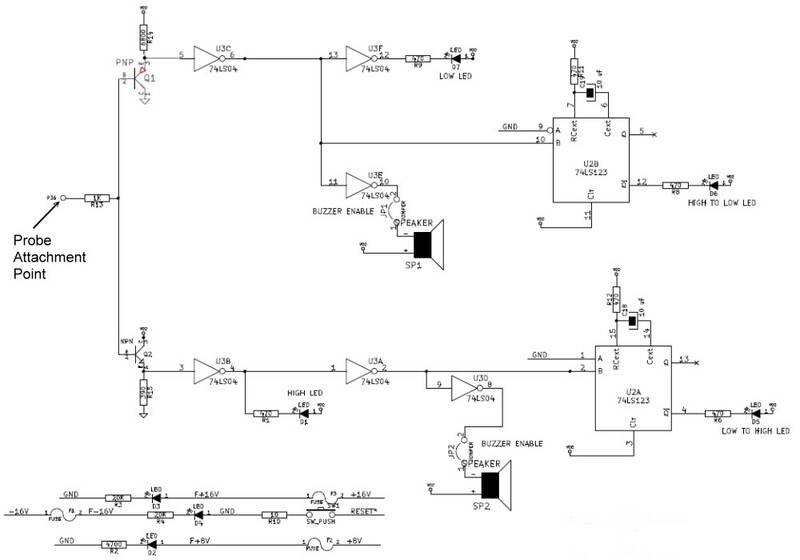 floating), the two transistors detect true TTL logic levels. You will see I have used somewhat higher resistors for the indicator LED's than is normally used. This is because I don't like them too bright and want them all at about the same intensity. You can use 470 Ohms or 220 Ohms if you like. 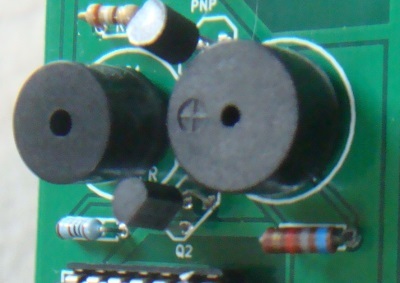 The two transistors are a common NPN 2N2222A and PNP 2N2907. The value to the R14 resistor (see schematic here) is critical and is unfortunately somewhat variable depending on the properties of the two above transistors. During board assembly leave the R14 resistor out initially and use a variable pot (connected between the collector of Q1 and Vcc) to find the highest value such that with the probe input connected to nothing, the "Low' LED does not light up but comes on immediately when it is connected to ground. On my prototype board the value was 20K. With my final board (and a different manufacture of the transistors) the value was 6.8K Ohms. There probably is a way to calculate all this but a temporary variable resistor (0-20K pot) is quick and easy. The value is not real critical. Once you determine the value drop in a common resistor near that value. Here is a short video showing the board in action. The detailed schematic can be seen here as well as the exact board layout which can be seen here. Please note there is a slight error in early schematics of the .pdf file at the bottom of this page. Most components are standard items that can be obtained from Jameco, DigiKey or Mouser etc. The S-100 connectors are hard to find these days. Mouser stocks them (part number 587-346-100, MFG PN: 346-100-520-202). 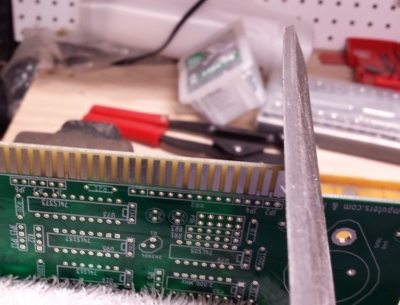 Note, you will have to cut a slit at the ends of the S-100 connector so it slides on to the top of the board. See the above picture. Jameco supplies the Resettable Fuses (part number 199938). Alternatively you can use Pico fuses (shown above). The two buzzers are Jameco part numbers 138713 and 76065. The reset switch, Jameco part number 1586074. BTW, this is a nice little project for somebody starting off building S-100 boards. Start with this and work your way up to the more complex boards. This simple board has no major errors/corrections. 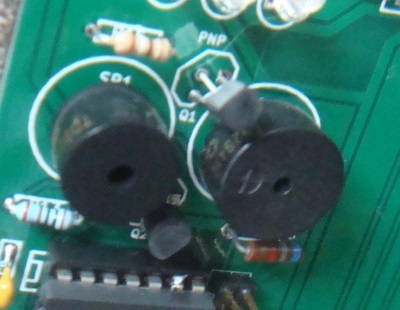 However the high/low trigger point for the probe is somewhat dependent on the two transistors. For a PNP 2N2222 and NPN PN2907 better values for R14 & R15 are 10K and 1K respectively. Also the sound pulse length should be lengthened by changing R11 & R12 to 1.2K. One frustrating thing with these boards if you use them a lot is that the test S-100 board is often difficult to get out of the extender board. While you certainly don't want it wobbling around a tight fit often pulls up the extender board from the bus rather than the test S-100 board itself. 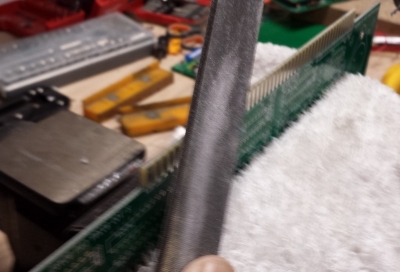 You can use your fingers to hold down the extender board as you remove the test S-100 board, but often it's difficult. Some S-100 pin edge connectors are simply a tight fit. 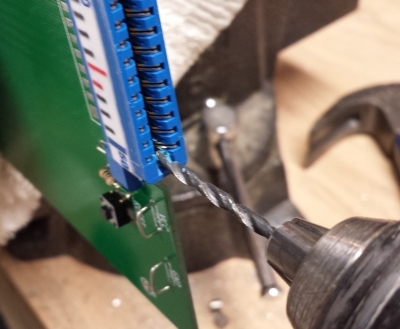 You can correct this by using a drill bit and very carefully enlarge the length of the S-100 pin slot on each side. One or 2 mm is sufficient. Be careful not to touch the 5V or ground pins. See the first picture above. Also the sharp edges of new S-100 board can the rounded a little with a file. One or two swipes at 45 degrees is all that is needed. See the two pictures above. Be very careful not to over-do any of the above suggestions. A loose board will create havoc in your system.